2nd North Carolina Mounted Infantry Regiment, U.S. The Union 2nd North Carolina Mounted Infantry was known by many names, including Home Yankees since the regiment often tramped and fought against their home communities that dared take up arms against the Union. To raise a weapon against your brother during the Civil War, well that actually happened if you donned Union blue and served in only one of two mounted infantry regiments from the Tar Heel State that had their ranks filled with men who were descendants of rebel stock, because they had dared raise a hand against King George during the American Revolution. The Federal 2nd North Carolina was formed by loyal Union men from western North Carolina and East Tennessee, while Confederate deserters formed a fraction of the regiment. Knoxville, Tenn., October 1863. Attached to 1st Brigade, Willcox's Division, 9th Army Corps, Left Wing Forces, Dept. Ohio, to April 1864. 1st Brigade, 4th Division, 23rd Army Corps, Dept. Ohio, to February 1865. 1st Brigade, 4th Division, District of East Tennessee, Dept. of the Cumberland, to August 1865. Ordered to Greenville, Tenn., to October 16, 1863, and assigned there till November 6. Moved to Bull's Gap November 6, and duty there till December. March across Clinch Mountains to Clinch River. Action at Walker's Ford on December 2. Gibson's and Wyerman's, Miss., February 22, 1864. Duty at Cumberland Gap and patrol duty in East Tennessee till April 1865. Scout from Cumberland Gap January 23-27, 1865. 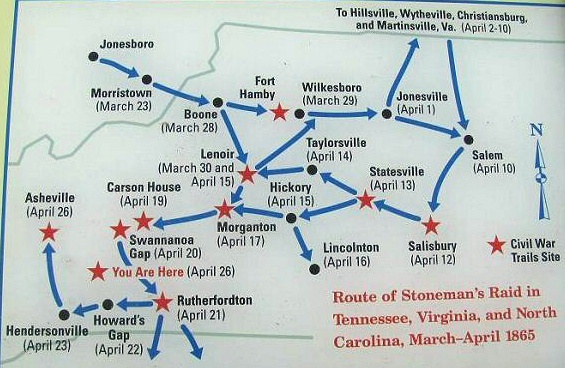 Expedition from East Tennessee into Western North Carolina March 21-April 25, 1865. Moved to Boone, N.C., April 6, and to Asheville, N.C., April 27-30. Duty in North Carolina and East Tennessee till August. Mustered out August 16, 1865. The Union Army recruited two mounted infantry regiments within North Carolina, and both units, 2nd North Carolina Mounted Infantry and 3rd North Carolina Mounted, were raised principally from loyal Union men of Western North Carolina counties. The men who formed the 2nd North Carolina Mounted Infantry were recruited from Western North Carolina, East Tennessee, and a fraction of its ranks were filled with Confederate deserters. Recruitment of these regiments epitomized the Brother's War, and the men serving in these two Union units were commonly referred to as Home Yankees and tories. Union Major General George Stoneman's command as it concerns Western North Carolina in 1865: Second North Carolina Mounted Infantry Regiment, Lieut. Colonel William C. Bartlett; Third North Carolina Mounted Infantry Regiment, Colonel George W. Kirk; First Brigade, Commanding Colonel Chauncey G. Hawley; Fourth Division, Department of the Cumberland, Brig. General Davis Tillson; District of East Tennessee, Major General George Stoneman. To view entire Union District of East Tennessee, including 1st and 2nd Brigades, and Brig. Gen. Gillem's Cavalry Division, see Stoneman's Cavalry Raid and O.R., 1, 49, pt. II, pp. 538-539*. Sources: National Park Service: Soldiers and Sailors System; Official Records of the Union and Confederate Armies; North Carolina Museum of History. The text is enhanced with illustrated portraits of East Tennessee individuals who contributed to the Civil War effort. Originally written and published in 1888, this reprinted edition is accompanied by a complete index. This book is a valuable addition to both the Tennessee historian and the Civil War buff. Confederate authorities were understandably worried about the rail lines and how to protect them. Inevitably the stage was set and on a cold Friday night, November 8, 1861, the Unionists proceeded with plans to burn the key railroad bridges of East Tennessee; President Abraham Lincoln had approved the plan. This thoroughly researched, easy-to-read narrative tells the incredible true story of the people and events in the ‘insurrection gone wrong’. John Barrett presents the complete story of military engagements and battles across the state, including the classical pitched battle of Bentonville--involving Generals Joe Johnston and William Sherman--the siege of Fort Fisher, the amphibious campaigns on the coast, and cavalry sweeps such as General George Stoneman's Raid. "Includes cavalry battles, Union Navy operations, Confederate Navy expeditions, Naval bombardments, the land battles... [A]n indispensable edition." Also available in hardcover: The Civil War in North Carolina.